The fall of the czarist in March 1917 brings an end to decades of oppression and is greeted with joy among the Jewish community. The Provisional Government, as one of its first acts, abolishes all limitations based on religion or nationality. For the first time in their history, the Jews of Russia are free to organize and express themselves. Synagogues and schools are opened, publications appear in Hebrew and Yiddish, and political and cultural life flourishes. At your left, Bund members during a festive demonstration in 1917. The end of decades of oppression was celebrated by all Jewish organizations. 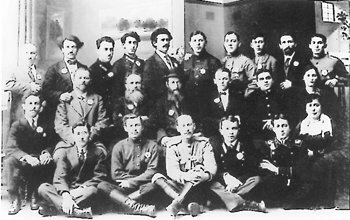 At your right, a conference of Zionists in Siberia in 1917. Support for the Zionist parties, already substantial among Russian Jewry, increased even more after November 2, 1917, when Great Britain declared its support for the establishment of a Jewish National Home in Palestine (the Balfour Declaration). 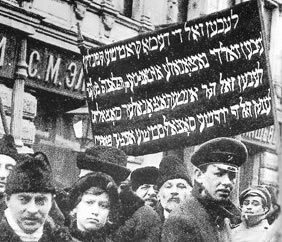 The Bolshevik seizure of power in November 1917 brings a halt to the developing Jewish communal life. The Bolshevik doctrine, as formulated by Lenin and Stalin, denies the existence of a national Jewish identity. Lenin declares national Jewish culture "the slogan of the rabbis and the bourgeois, the slogan of our enemies." According to Stalin, the Jews are a nationality on paper only, Zionism is a reactionary bourgeois movement, and Yiddish merely a jargon. The Bolsheviks believe that once socialism is firmly established, all nationality issues will automatically be resolved. For a period of transition, however, autonomy to national and cultural communities or to regions on a territorial base might be granted. In the case of the Jews, the result is both confusing and contradictory. The "Declaration of the Rights of the Peoples of Russia" recognizes the right to both religious and national autonomy, but subsequent decrees limit those rights profoundly. The separation of Church and State, introduced in January 1918, results in the confiscation of religious properties and the prohibition of religious instruction in schools. 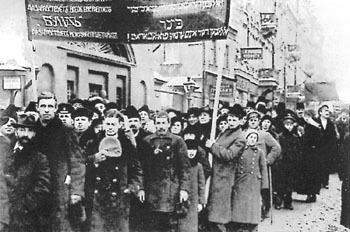 At your left, demonstration of the Jewish Socialist Workers Party demanding national autonomy in a democratic republic; Ukraine, 1917. Like most Jewish socialist parties, it split over the question of whether or not to support the Bolshevik seizure of power. At your right, the Eighth National Conference of the Bund, held in Petrograd in 1917. 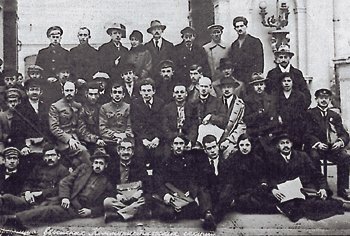 In the front row right is Esther Frumkin, who joined the Yevsektsii in the hope of saving the organization of the Bund. But the Bund was forced to dissolve in 1921. Esther Frumkin was arrested in 1938 and died in a labor camp in 1943. The creation of special "Jewish sections" (Yevsektsii) in the Bolshevik party seems at first a recognition of a Jewish nationality. In practice, however, the Yevsektsii conduct a systematic campaign against all aspects of Judaism and Jewish life. Its first decision is the dissolution of the kehilla, the Jewish community administration, which served as the main instrument of Jewish religious and cultural life. With the re-establishment of Poland and Lithuania in 1918, the more traditional part of Russian Jewry becomes separated from the newly founded Soviet Union where two and a half million Jews remain.